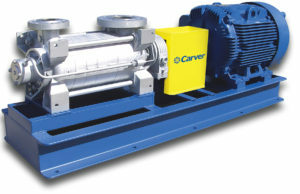 Callaghan Pump and Controls, Inc. is a master distributor of pumps in the five boroughs of New York City. 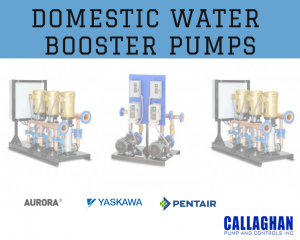 We sell Aurora fire pumps, and we sell Callaghan brand domestic water booster systems and tank filled systems. We do not install these systems but we sell them to licensed plumbers, licensed sprinkler fitters. 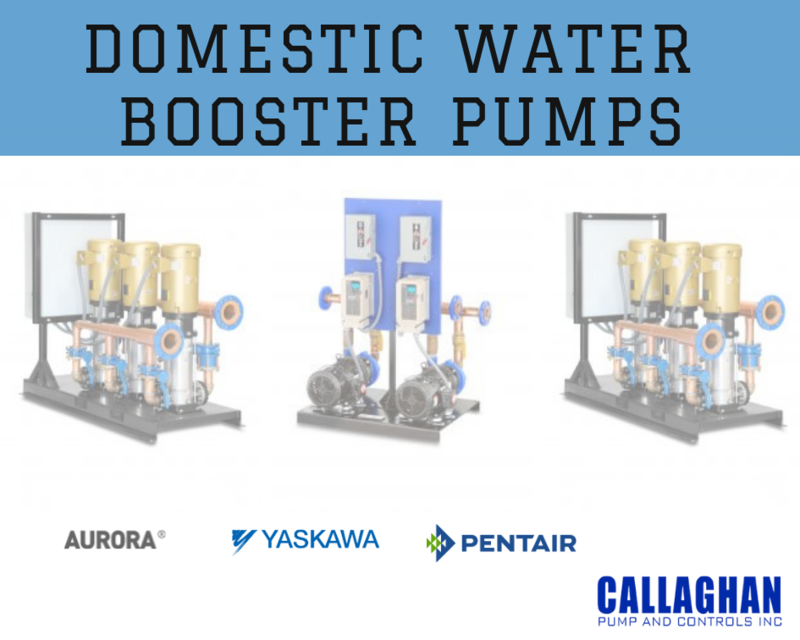 We help in the selection and sizing of domestic water pumps and we guarantee that our sizing calculator works. 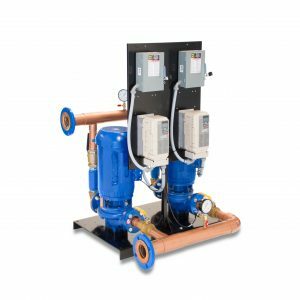 If you put in one of our domestic water variable speed pump systems and it does not satisfy your demands we will replace it free of charge (not including freight). Our systems are characterized by some key features. We only use Yaskawa variable drives. 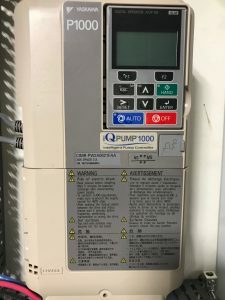 The model is iQpump1000. When we receive the drives from the factory, we cut a hole in the back of the control panel to make sure that the heat sink and the fan to cool the heat sink are outside of the control panel thus increasing the life of the variable frequency drive significantly. These drives are called smart drives. They have the ability to talk to each other, up to 6 drives. The micro-drives can have up to 4 talking to each other. So if one drive has pump 1 going at full speed and it is not satisfying the demands of the building, a second pump will start. 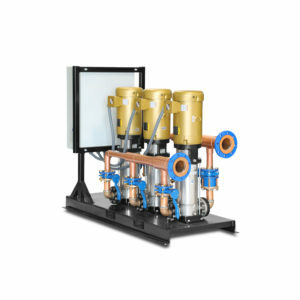 The pumps will work together at the same speed to satisfy demand. 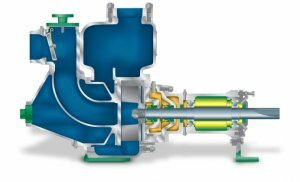 If both pumps are going full speed and they are still not meeting pressure (typically 80 psi), a third pump will start. I cannot emphasize enough how important it is to use smart drives. There is a lot of technical jargon that goes along with that but what is most important to know when buying drives — a smart drive can interpret the signal from the transducer all by itself and has the ability to call a second, third or fourth pump by itself. Cheap and inexpensive drives require a third party box (a small piece of equipment called a PLC, programmable logic controller) that is a huge red flag. If someone is selling you a domestic water booster system or tank fill that has a PLC in it you are buying 1980s technology. The problem with these systems is that every PLC is programmed differently by different people. If something goes wrong, you are at the mercy of that individual programmer. If he/she is not around, on vacation, or no longer employed by the company, you are out of luck. When you use Yaskawa iQpump1000, there are 15-18 degreed engineers on the technical hotline at Yaskawa that can help walk you through any problem. Simply give them the serial number on the VFD and they can walk through making changes, resetting the drive, etc. They are there to help whatever the situation calls for or needs. Another advantage of smart drives is your ability to adjust them. If you would like to raise or lower the pressure, you can do that from the keypad or with the additional BART system you can make these changes remotely from your cell phone, laptop, or any similar device with an internet connection. 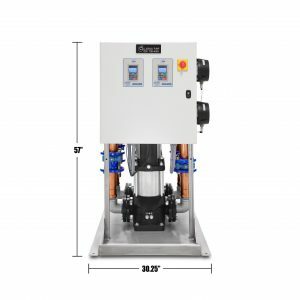 I have a 50-gallon drum that has already been emptied once and I am now filling it a second time with cheap drives and cheap PLCs from other companies who installed them and in 5-7 years they have failed. I take them out and throw them in the drum to remind myself of the garbage that other people sell. 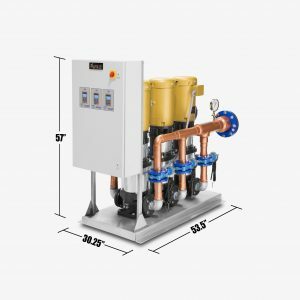 Callaghan Pump will never supply a VFD with a PLC in it. We used to do so until we discovered the invention of smart drives. We switched even though the drives were more expensive. Typically, cheap drives cost between $100 – $200. An intelligent drive, which are produced by a few companies, for a 5hp can run between $800 -$1200, but you don’t need a PLC or the additional wiring. In my opinion, if you keep it simple, the less parts the better, the fewer things to fail. The initial outlay saves future costs of repairs and replacements, as my 50 gallon drum illustrates. 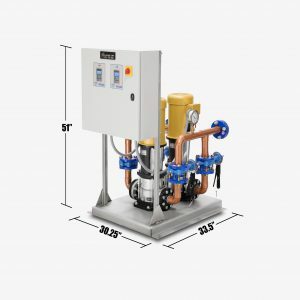 Call us to find out how we can help you with your domestic water booster system needs in New York.